It started it out with me painting a flamingo, hating it, and then painting these pink feathers on the backside of the same paper. I love the way the feathers turned out so I will definitely be painting more of those! Then I played with a little leaf design. I got the inspiration for that from some stationary I saw at a store. I find inspiration for paintings and colors just about everywhere.... in nature, stores, online, food, and clothing. Maybe it's because I'm always looking, always thinking about art. Out of all the hundreds of ideas I have for a painting, only about five of them ever happen. Partly because I forget, think of something better, or I just plain don't have time to paint them all. Where do you get inspiration for creating? from you! your stuff is amazing. you should do a watercolors for beginners tutorial or something. i have a paint set and have done a few things, but would love to know more from someone like you. your stuff would look awesome hung all over my house. LOVE IT ALL! I love your watercolors. Thanks for sharing them with us. 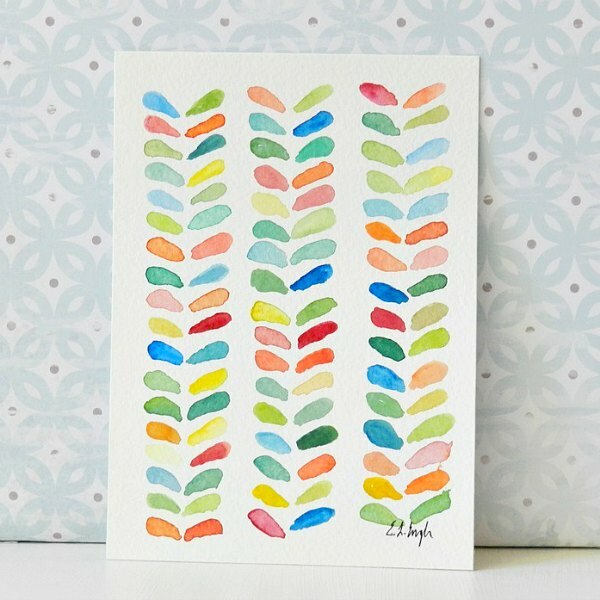 Out of curiosity, when you painted the leaves in many different colors, did you have a dozen or so different brushes in use at the same time, or were you constantly painting a stroke, then washing and drying and starting with a new color? I was trying to imagine the logistics of painting with so many different colors scattered all over the page, and it seems so tricky, especially to achieve a pleasing balance in the final design. You're amazing! Thanks and yes, I did use just one brush for the painting. I had to rinse my brush about a million times. I hadn't even thought of using more brushes, but that would have saved me some hassle. These are sweet. Love your water color painting. I am waiting for my Holbein set to come. I ordered on line. Gorgeous work! I always love seeing your watercolors when I stop by. That's the one kind of art that I just never really was able to get, so I'm very jealous! I love it! The feathers are gorgeous! I love your style. I love that first one! love! Btw, got this pinned. Coming from Someday Crafts' whatever goes Wednesdays link up. I love how colorful it is! I know nothing about watercolor but would love to recreate this!